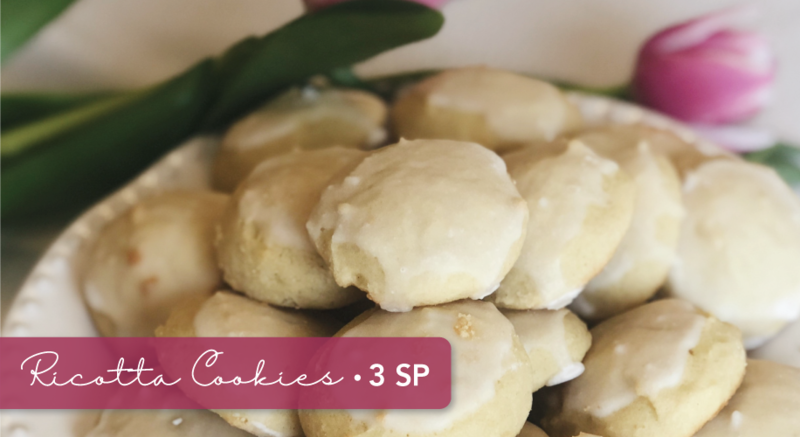 I don’t know which is more exciting – the fact that I’m writing my first recipe post or the fact that my first recipe is for my FAVORITE Italian Ricotta Cookies! I mean LOOK that them! I don’t know if it’s an Italian thing or what, but everyone in my family bakes these cookies! My mom learned this recipe from her aunt, but we all have our own little twists & versions. Safe to say they’ve become a holiday necessity. Truthfully, I was worried I’d have to go without them this year due to Weight Watchers, but once I took the time to calculate the recipe, I discovered their point value was waaaay less than expected. I mean… they aren’t exactly low-fat but…3 SmartPoints?!??! Plus if 3 SmartPoints are still too high for your liking, this recipe can easily be tweaked with low-fat ricotta & dairy options. And if that’s still not low enough, you can always ditch the glaze for a total of 2 SP. I’ve done it numerous times and trust me, they’re just as delicious! My Easter dinner was pretty light, so 3 SP ended up being perfect for me. Okay, enough blabbing, time to make these Italian Ricotta Cookies! Cream room temperature butter, sugar, and eggs in a large bowl. Begin blending at a low speed, slowly increasing to high to create a fluffy consistency. Add in vanilla extract & ricotta to the creamed butter and blend well on low. Begin adding dry ingredients (flour, baking powder, baking soda) in small amounts to the mixture. Blend all ingredients until dough forms. Line baking sheet with parchment paper and begin dropping cookies onto the sheet. Keep the cookies tbsp sized. Cook in the oven for 10-12 minutes. Add powdered sugar into a small bowl. Drop milk in, one to two tsps at a time. Stir together. Dip the tops of the completely cooled cookies into glaze and set on racks to completely dry. Still looking for something sweet? Check out this Maple Brown Sugar and Cinnamon Overnight Oats that I’ve been LOVING for breakfast. Wishing you all a happy and healthy rest of your day. Did you bake these cookies? Take a photo and tag me on Instagram for a feature!